Armadillos — coming soon to a place near you? The nine-banded armadillo (D. novemcinctus) has the widest distribution of any armadillo species. Only two armadillo species occur outside of South America — the nine-banded armadillo and the northern naked-tailed armadillo (Cabassous centralis). C. centralis may be found in Central America as far north as the extreme southern boundary of Mexico. The nine-banded armadillo has expanded its range northward into the United States over the last 150 years. Prior to about 1850, the nine-banded armadillo was not found north of the Rio Grande river. The sudden and extremely rapid armadillo colonization of the southern United States has puzzled quite a few biologists. The degree of range expansion per year is nearly ten times faster than the average rate expected for a mammal. Sightings of the animals farther north are reported every year, prompting many people to wonder just how far north the armadillo will go. Where did the armadillos come from? Members of Superorder Xenarthra (sloths, anteaters and armadillos) originated in South America. Many mammals migrated into North America across the newly-formed Panamanian land bridge about 3 million years ago. About half of the animals moving north were Xenarthrans. Giant ground sloths and glyptodonts, among others, migrated into the open plains of North America. All of these first Xenarthran migrants into the modern United States were extinct by about 10,000 years ago. The beautiful armadillo (Dasypus bellus) was the last member of the genus Dasypus to live in North America. D. bellus ranged as far north as Missouri, Iowa and Nebraska prior to its extinction around 11,000 years ago. (See this beautiful armadillo article on the Illinois State Museum web site for more information.) For several thousand years, there were no armadillos in the present-day United States. The majority of the Xenarthran species continue to be limited to South and Central America to this day. Why is the armadillo moving north again? Rivers: Although armadillos are good swimmers, the Rio Grande is a formidable barrier. Large rivers such as the Mississippi continue to deter or delay expansion in some areas of the US. It is likely that very few animals will attempt to cross such large rivers. Hunting and Predation: In many parts of South and Central America, armadillos are a valuable food source. Overhunting has threatened many species. The hunting practices of native peoples of northern Mexico and southern Texas probably limited the number of armadillos in the area. Large predators such as wolves and panthers also likely contributed to limit distribution. Lack of Suitable Habitat: Nine-banded armadillos live in a variety of habitats, but prefer brushy or forested areas which provide lots of cover. Due to yearly burnoffs (both natural fires and those started by humans) Texas was largely covered by prarie grasses. With the mass colonization of Texas by American settlers in the late 1800’s, these physical, societal and ecological barriers to armadillo expansion were reduced or removed. Increased travel across the Rio Grande resulted in more armadillos moving across the river. Suppression of Native American culture reduced hunting pressure on the armadillo, and the halting of yearly prarie fires allowed more mesquite brushland to invade the open grasslands. The majority of the animals were probably brought across the Rio Grande by humans as a food source. Animals that attempted to swim across were not more successful than previous armadillos in swimming, but were lucky enough to find a more suitable habitat. Decreased hunting pressure, coupled with a decrease in large predators due to human activity, allowed the armadillo population to increase on both sides of the river, resulting in a larger population base. Armadillos do not tend to move from the area they are born in unless the population is high. A larger population resulted in an increased density of animals, prompting emigration and subsequent expansion of range. The advancement of American settlers and farming practices also allowed the armadillos to invade the United States. Colonization of other states was helped by the deliberate or accidental release of captive animals. The Florida armadillo population, for example, was the result of a few animals released from a small zoo in 1924, combined with several more that escaped from a traveling circus in 1936. Movement of cattle from Texas to other states by railway also helped the armadillo. There are several reports stating that stowaway armadillos were fairly common in cattle cars. The armadillos would often escape when the cars were unloaded. The regular production of identical quadruplets, as well as the ability to delay implantation of fertilized eggs for 14 months or more give the nine-banded armadillo a high reproductive rate. Life spans of up to twenty years, coupled with the reproductive success of the animals, means that it only takes a small number of armadillos to successfully establish stable populations in new areas. How far north will the armadillo go? Armadillo expansion into the United States appears to be limited primarily by temperature and rainfall. Armadillos have very little body fat, and are not good at conserving heat. Long periods of extremely cold weather are dangerous, especially to younger animals. Armadillos cannot establish stable colonies if the average January temperature is below -2°C (28°F). They also require a constant source of water. Estimates indicate that armadillos can survive in areas that receive at least 38 cm (15 inches) of precipitation annually. Comparing this information with annual weather and rainfall data for the United States, Taulman and Robbins generated a potential range map for the nine-banded armadillo. They estimate that the nine-banded armadillo could establish stable populations from Nebraska to New York, and northeast to Cape Cod. Although physiological barriers prevent the armadillo from moving farther west on its own, human introductions (accidental or otherwise) could establish populations in parts of Arizona, Colorado and New Mexico. Animals released on the west coast could range from California to Washington and into parts of Canada. Regions of eastern Washington and Oregon, and part of northwest Idaho could also support armadillo populations. The published range of the armadillo in 1997 suggested that only about half of the potential armadillo habitat is currently colonized by the nine-banded armadillo. The map below illustrates the established range of the nine-banded armadillo (as of 1995) in dark green, with the estimated potential future range in light green. Current data suggests that this prediction has been fairly accurate. Does this mean we will see armadillos in New York’s Central Park? Armadillos digging up the potato fields in Idaho? Armadillos sipping coffee in Seattle? Armadillos riding the streetcars in San Francisco? Enjoying the seashore in Massachusetts? Perhaps some Canadian armadillos in Vancouver, eh? Only time will tell! If you live in one of the areas targeted for armadillo invasion, keep your eyes open for invading armadillos. Report sightings to your local wildlife officials to help keep range data current. If you don’t think that armadillos will ever make it in your neck of the woods, keep in mind that another South American mammal, the Virginia opossum, successfully invaded the United States despite the cold winters and physical barriers to range expansion. For the nine-banded armadillo, it looks like it’s Canada or bust! Taulman, J F, and Robbins, L W 1996. 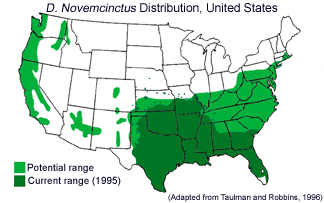 Recent range expansion and distributional limits of the nine-banded armadillo (Dasypus novemcinctus) in the United States. Journal of Biogeography 23: 635-648. Nowak, R.M. 1999. Walker’s Mammals of the World, 6th edition. Johns Hopkins University Press, Baltimore, MD. 158 — 168.